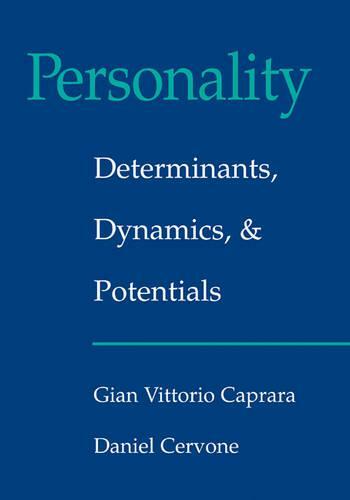 Personality: Determinants, Dynamics and Potentials, first published in 2000, is a comprehensive survey of research and theory in personality psychology. The book provides balanced coverage of biological, cognitive, affective, social, and interpersonal determinants of personality functioning and individual differences. The authors organize these factors within an overarching theoretical framework that highlights the dynamic transactions between individuals and the sociocultural environment, and the human capacities for self-reflection and self-regulation. The book's broad, integrative approach to the study of personality reveals how advances throughout the psychological sciences illuminate the classic questions of personality psychology. The volume is designed as a textbook for advanced-level courses and as a reference for professionals in psychology and related disciplines. The book meets personality psychology's need for an integrative analysis of the field that reviews recent advances, places them in their historical context, and identifies particularly promising avenues for the discipline's future development. "Fifty years ago, Gordon Allport, a founder of personality psychology, implored: 'No door should be closed in the study of personality.' Now, Caprara and Cervone have written a book that opens doors onto this exciting field. The book is peerless in its breadth of scholarship and open-minded attitude toward psychological science. I recommend this remarkably informative book to fellow researchers and teachers; all of us will learn a great deal from it and so too will our students." Professor Avshalom Caspi Institute of Psychiatry, London, and University of Wisconsin-Madison"